An iIllustration of the Gospel reading for Epiphany Sunday. The lectionary is kind of like Abe Lincoln’s comment on fooling people. Most pastors preach from the lectionary some of the time, and some pastors preach from the lectionary all of the time. Personally, I like it when our pastor preaches from the lectionary, because it makes me look incredibly perceptive – almost psychic – to readers not from St. John’s. “This is so amazing,” they say. “My pastor used this very passage on Sunday!” Readers at St. John’s just figure I’m in cahoots with the pastor, and while that’s not completely true, there’s some truth in it. So what is a lectionary, and why do we use it? The Revised Common Lectionary (RCL) is a set of scripture readings designed to “read through the Bible” on a three-year cycle during worship services. Typically there are four readings: one each from the Gospels, the Old Testament or Acts, Psalms, and the Epistles. In a given year, virtually all of one of the first three Gospels and about a third of the remainder of the New Testament (including John) will be read. Because the OT is so much longer than the NT, not all of the OT is read in the 3-year period. For some parts of the liturgical year, OT readings come in two “tracks”; Track 1 provides semi-continuous readings from selected books, and Track 2 provides readings related to the Gospel readings. The RCL is used widely by many Protestant denominations in the USA, UK, and Canada; a closely related lectionary is used in the Roman Catholic Church. This month we will read from the lectionary to see how it works. Since there are only four readings per week, we’ll also take a look at some Track 2 readings. Keep in mind that these are the lectionary readings for 2011. In other years, the readings may differ, although they are likely to be the same on Epiphany Sunday and the following Sunday, which celebrates Jesus’ baptism. Epiphany always comes on January 6, and Epiphany Sunday celebrates the coming of the magi to the Christ child. Naturally, the Gospel reading tells that story. Peter Paul Rubens apparently did not read the scripture for himself or listen carefully in church. Notice the straw in what surely is a manger. Notice what appears to be a chicken on a shelf above the head of the standing wise man. Notice that vs. 11 says they “went into the house and saw the child.” This verse (and the two turtledoves we talked about the other day) provide strong evidence that the magi were not present at the manger, no matter what the picture shows us. Scripture doesn’t tell us there were three people, or that the people were men, or that the people came from various continents. It only tells us that wise people came from afar and rejoiced when they found Jesus. All the rest is ancient legend, and you may believe it if you want to, as long as you realize it isn’t in the scripture. 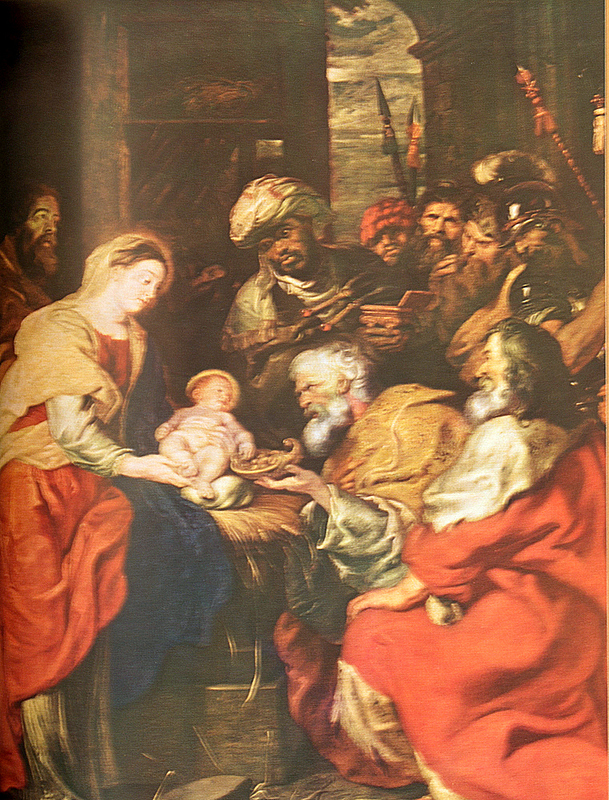 "Adoration of the Magi" by Peter Paul Rubens, from the Gamble family Bible, now in the private collection of Regina Hunter. Photography by Daryl Lee. The first Sunday after the Epiphany celebrates the baptism of Jesus, which marks the beginning of his public ministry, which in turn ultimately resulted in his recognition as the Messiah. When Jesus came up from the water, a voice from Heaven said, “This is my beloved son, in whom I am well pleased.” The Old Testament reading for this Sunday is a Messianic prophecy in which God says that he is pleased with the servant. For the last time this season, Merry Christmas! My granddaughter got a Bible for Christmas, and as near as I can tell, her favorite part is the diagram of the Christian year. Christmas lasts from December 25 until the day before Epiphany, which is January 6. The Sunday after Epiphany celebrates Jesus’ baptism; one thing that happened at the baptism was that the voice of the LORD was heard. Appropriately, the lectionary psalm for this Sunday talks about the power of the voice of the LORD. Several years ago someone griped to me about the lectionary readings that were going on at St. John’s, primarily on the grounds that the scriptures weren’t related to each other. I said that I could just about always figure out the connection, but admittedly sometimes I had to work at it. Now, at first glance our lectionary reading from Acts looks a little odd. This Sunday celebrates the baptism of Jesus. While the reading does mention that John was baptizing, it doesn’t actually say that Jesus was one of the people John baptized. Furthermore, if the reading were just five verses longer, we’d see that the Cornelius and his entire family were baptized at the end of Peter’s speech. So this scripture really is about baptism, but you may not recognize that fact if you aren’t familiar with it before it is read in worship. In this week’s lectionary readings, we’ve read a psalm about the voice of the LORD; Peter’s speech to the family of Cornelius before allowing them to be baptized, even though they were Gentiles; and a Messianic prophecy saying how pleased the LORD is with his servant. Our Gospel reading tells the story of Jesus’ baptism, and this Sunday celebrates the baptism. If all lectionary readings were as clearly related to the liturgical calendar and to each other as these four are, no one would ever have any trouble with the lectionary, right? Copyright 2011, 2013, 2015, 2016 by Regina L. Hunter. All rights reserved.